Ok let`s do some professional information on the 111mm Services Range Wood saw. This is the wood saw that was tested complete over several years and on any type of materials I could find. It is made of stainless steel and it got the cut teeth that work both ways. The tip is made so you can use it to hollow with. A destruction test is in many ways a failed test so I am glad that this wood saw is alive and kicking. It does not require a lock because it is the correct motion that is the key to the best functionality. The angle on this is a bit over hand so it will never accidental close during correct use. The durability is very high on this design and it is a multi-tool in its own and this wood saw together with the main blade makes this a competitor against large fixed blade outdoors knives. It is made to be used on wood, bone, fabrics and rope if necessary. The best way to learn about the correct use is to try it out and to learn that it is not about using too much force when you cut. You can adjust the angle with the hand for the best motion and to make it rip into the material controlled. It is important to have a good grip that is secure so you avoid slipping. There is flexibility in the steel so it will take some hard using without bending. It is important that you have a straight during motion so you avoid damage. If you do not follow a straight line then you put more strain on the construction and design. It will also make it heavier to cut. This wood saw 9cm long and the cut section approx. 8,5cm long. This tool takes strong cold and warm weather as well. It is also possible to sharpen it if necessary but that I can say is usually never required from normal use. I exceeded every limit that is possible in my philosophy. The advantage with this is that you can cut large branches and small tree`s with little problem. Softer wood or harder wood it will cut it for sure. It is smart to clean the saw a bit before you close it in the body of the knife so you avoid substances into the mechanism. The hardening is perfectly done by Victorinox and the steel with construction the same. The design of the wood saw is made to be able to hollow with and it tapers in thickness all across the design. The inner section is approx. 1,50mm at the teeth and on the back it is approx. 1,25mm. On the middle of the saw the teeth is approx. 1,50mm and on the back it is approx. 1,30mm. At the tip section the teeth are approx. 1,50mm while the back is 1,40mm thick. There are probably some variations as well. The design is correct for the best cutting performance and durability. It got flexibility in the complete design and the tip section will not bend. During use it is unavoidable the tip section will take some extra abuse. In some cases you would have to cut around a small tree because you cannot cut the entire tree because it is not long enough. The design is complete. The wood saw is on the New Solder 2008 type knife and that is no surprise. In the history of SAK the cut section got variations on the angle they are grinded. On SAKs the design used today is the absolute best possible because it is a more versatile design. It is not just made for wood. During use it is important to have a good grip and avoiding hand fatigue. This you can only learn from practice. Do not use the entire body into the motion. Be relaxed in the body and focus on the correct motion. Remove some dust and wood particles from time to time. This will avoid the saw from just sliding over the material. Remove some from the cut teeth as well because this will also prevent it from just sliding over the material and the result is that people use much strength and get fatigued. In this angle you can see the marks from the years of testing. This was not so easy to see from the top picture. I have sharpened this wood saw one or two times. It was used over 200 times before sharpening. That should equal several thousand back and forth cuts before sharpening. It really was not necessary. It was used on all kinds of wood types. Now it is time to read the cut sections and to see what places that are most worn. First I can tell that it was tested on all kinds of materials like I said before. If you only use this on wood and some bone when hunting then this will never need any sharpening. I made sure to use all parts of the saw along the cut sections. It is pretty much worn the same all over the cut parts along the saw. 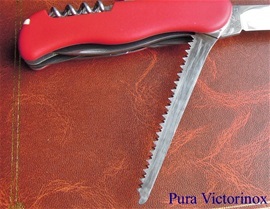 It is excellent for cutting small branches and small tree`s. I know that the Fireman 0.8383 has been used for all kinds of work. Most usual it is the center part of the saw that will be used the most. It is important to try to use the total length of the it without coming outside the tip so you disrupt the motion. The design of this is one of the reasons for the durability. I believe the HRC on the wood saw is in the 53/54HRC range. This is a part that I am seeking further information about. Stainless steel must be hardened correct to achieve functionality and corrosion resistance. I do believe the design got a big influence on the durability. The wood saw is there so a person does not have to use the fixed blade knife to baton/chop a small tree or a branch. To chop wood is many times not controlled enough to be considered safe for services. It also makes too much noise. To baton can be ok for splitting wood for fire or to split wood that can be further processed to make things from. Everything is much more controlled with a dedicated saw anyhow. Using this wood saw on many materials I could understand what you can do with a size like this. When you have split wood with an axe over the years you understand that wood grows differently. It can twist or grow in any possible direction. I cut areas that were harder and almost so hard that metal get scratched. I learned from all this and took notice on how things functioned wet or dry, cold or hot.